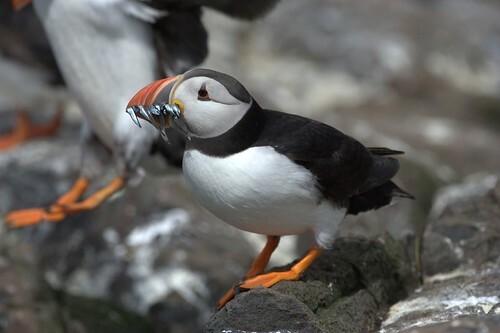 #Evol2012: Puffin poop and predation pressures « Nothing in Biology Makes Sense! Rowan Barrett discussed two big experiments in adaptive evolution: In the first, he and his collaborators collected armor-plated threespine sticklebacks the ocean and introduced them into artificial ponds filled with freshwater, and found that the fish evolved reduced armor plating [PDF], just as they have in many natural colonizations of freshwater. The second experiment, which is only just beginning to produce data, is tracking the evolution of coat color in mice kept within huge enclosures on the light-colored soils of the Nebraska sand hills and adjacent, darker-colored soil, to see if they evolve better-camouflaged fur over time. In both cases, the genetics of the expected changes are well known, so Barrett is able to track adaptation from gene frequencies to phenotypic change across multiple populations. Finally, Matt Walsh discussed a couple of cases he’s studied in which evolution in response to other species can feed back to alter the ecology experienced by the species involved. In the first case, Trinidadian kilifish collected from streams that contain predators have evolved a different life-history strategy than kilifish from streams without predators: those evolved with predators are ready to begin reproduction at an earlier age and produce more eggs; and are better able to take advantage of increased food resources as a result. In the second, he showed that Daphnia waterfleas which experience year-round predation reproduce more slowly than those evolved in lakes where their major predator is present only part of the year; in those lakes experiencing seasonal predation, Daphnia populations grow rapidly while predators are absent, and can eat enough algae to substantially change the water clarity. This entry was posted in conference, Evolution2012, field work, genetics, natural selection and tagged next-generation sequencing, predator-prey interactions.